Basically I’m a landscape painter and living in Colorado affords me a wealth of subject matter. In late July I decided to check out Shrine Pass. What Luck. The mountain flowers were in full bloom and as I reached the summit I was met with a sea of color. It literally took my breath away. At first I felt the massive sea was a perfect find, but then my eye caught a single Indian Paintbrush. It was sitting there in all its glory. Using a dead tree stump as its throne it seemed to be saying, “I am the king and these beautiful subjects are my kingdom.” I certainly couldn’t disagree with my new found king, but I think “chief” would be more appropriate. Painting is the reflection of the age in which it’s done. Every culture in history can be examined through it’s art. I feel as a painter that my legacy will live on to explain the time and place in which I live. 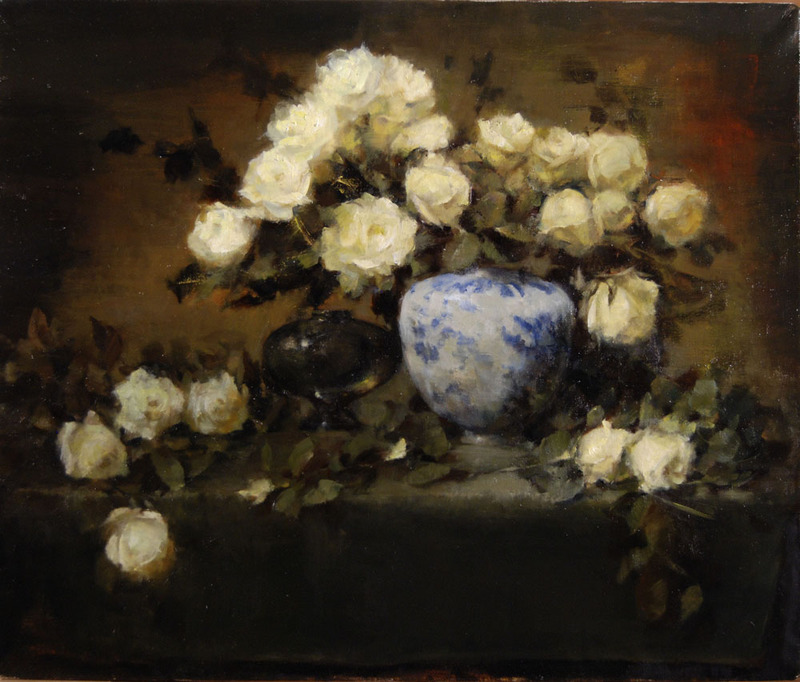 Roses have inspired me to paint the most sensitive pictures. The portrait of these yellow roses is a testament to the beauty and grace of nature. 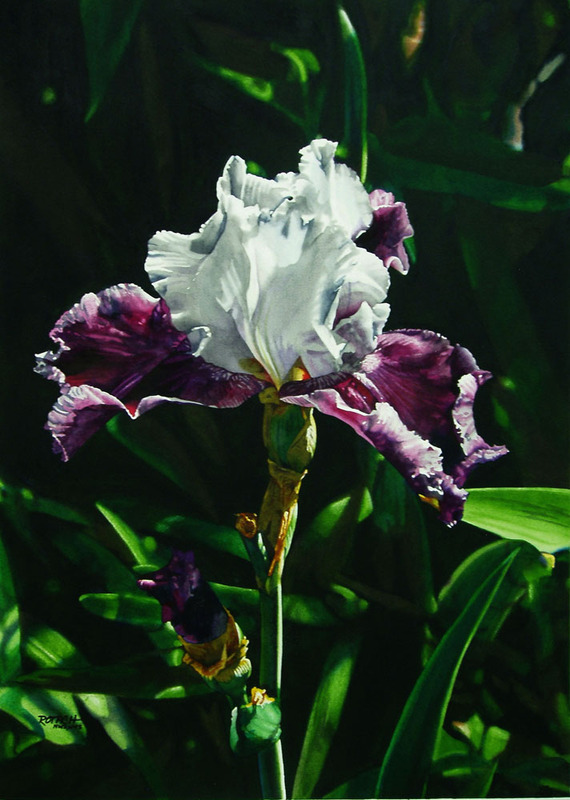 While walking my dogs one spring morning, I came upon this singular Iris. I generally carry my camera on these outings because I know the best gardeners in the area. This singular blossom stopped me in my tracks… the sunlight had wonderfully caught its form against a very dark background. The natural contrast was like a living Caravaggio and the scene reminded me of a soprano in a Mozart opera, center stage raising her glorious voice to the skies. I am a great believer in the strength of the individual and this fragile blossom seemed the embodiment of power. A quiet but inspirational moment… hence the title, “The Soloist”. 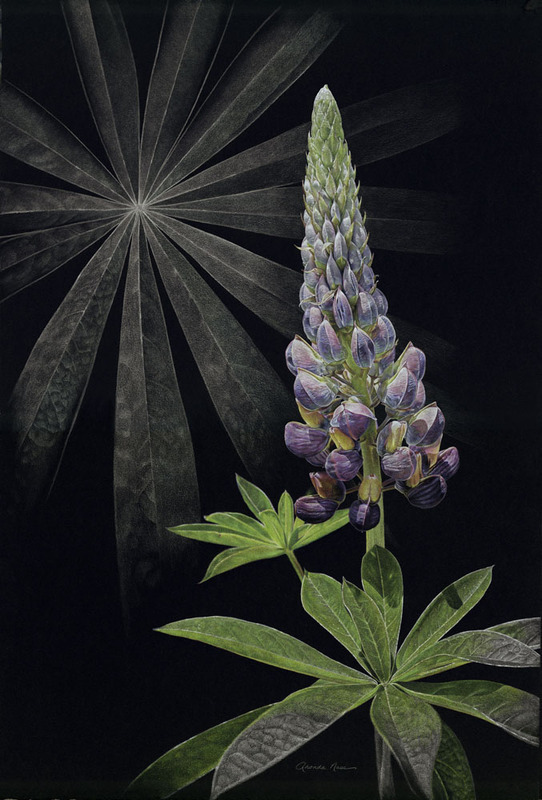 The idea of “Illuminated Lupine” began while on a walk near our home: I was struck by the dramatic lighting, coloring and detail of the lupine blossom cluster and, wanting to go beyond the botanical artwork I’d been doing, I designed the composition with a backdrop of a monochromatic magnified leaf. 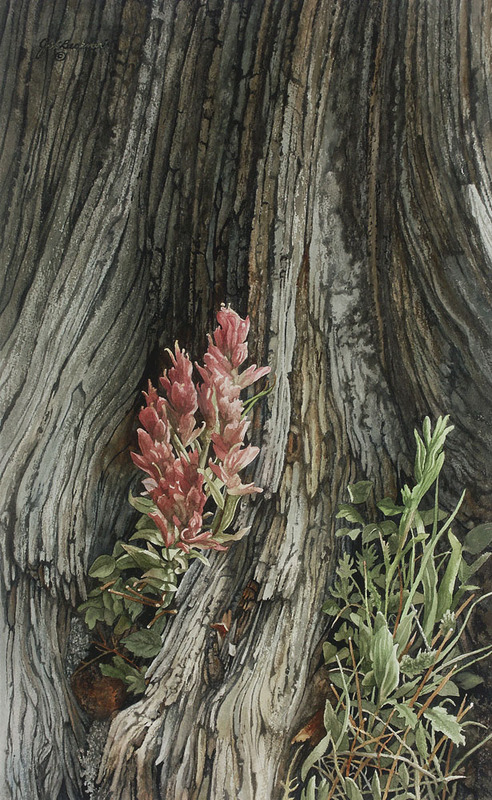 My hope is that this colored pencil drawing of a lupine will bridge the traditional field of botanical art (with its requirements of scientific accuracy and inclusion of different plant structures) with contemporary illustration (with its message-driven communication) to create a unique artwork which touches many. As with most of my artwork, I also hope to represent as best I can God’s obvious joy and attention to detail in His handiwork. I enjoy capturing the essence, or life force of flowers, knowing that they fade quickly. This rose seemed to be lit from within. 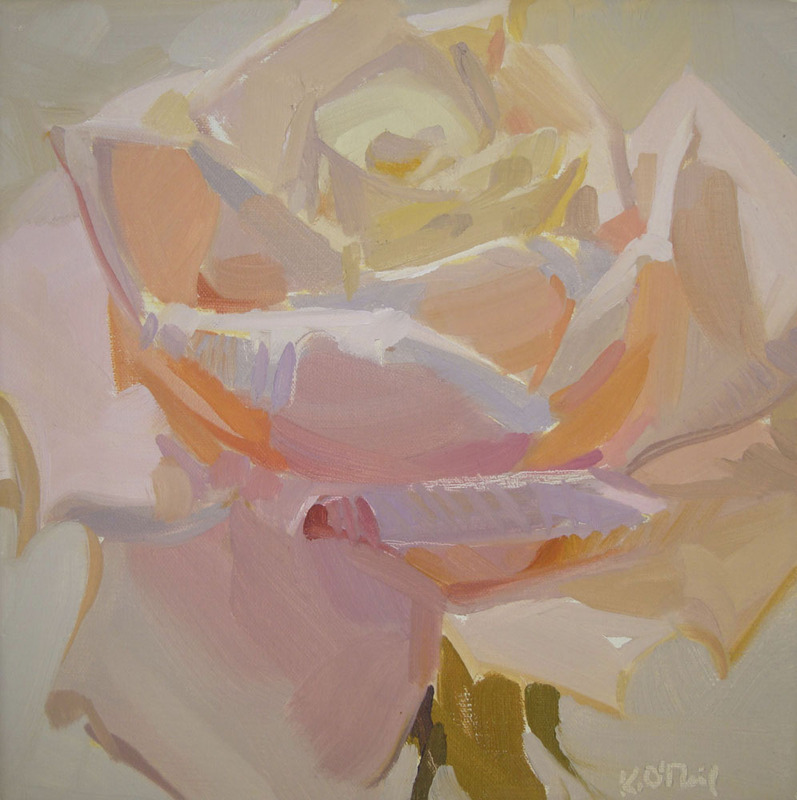 I was fascinated by the contrast of the solid structure of the form of the rose, and the subtle, delicate color shifts that construct the form.